The domain within your query sequence starts at position 1881 and ends at position 2113; the E-value for the MA domain shown below is 1e-112. 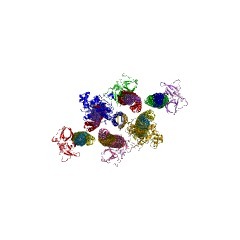 This entry represents the signalling domain found in several methyl-accepting chemotaxis proteins. 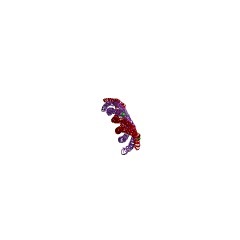 This domain is thought to transduce the signal to CheA since it is highly conserved in very diverse MCPs. There are 174691 MA domains in 174382 proteins in SMART's nrdb database. Taxonomic distribution of proteins containing MA domain. This tree includes only several representative species. The complete taxonomic breakdown of all proteins with MA domain is also avaliable. Click on the protein counts, or double click on taxonomic names to display all proteins containing MA domain in the selected taxonomic class. Chemotactic adaptation is altered by changes in the carboxy-terminal sequence conserved among the major methyl-accepting chemoreceptors. In Escherichia coli and Salmonella typhimurium, methylation and demethylation of receptors are responsible for chemotactic adaptation and are catalyzed by the methyltransferase CheR and the methylesterase CheB, respectively. Among the chemoreceptors of these species, Tsr, Tar, and Tcp have a well-conserved carboxy-terminal motif (NWET/SF) that is absent in Trg and Tap. When they are expressed as sole chemoreceptors, Tsr, Tar, and Tcp support good adaptation, but Trg and Tap are poorly methylated and supported only weak adaptation. It was recently discovered that CheR binds to the NWETF sequence of Tsr in vitro. To examine the physiological significance of this binding, we characterized mutant receptors in which this pentapeptide sequence was altered. C-terminally-mutated Tar and Tcp expressed in a receptorless E. coli strain mediated responses to aspartate and citrate, respectively, but their adaptation abilities were severely impaired. Their expression levels and attractant-sensing abilities were similar to those of the wild-type receptors, but the methylation levels of the mutant receptors increased only slightly upon addition of attractants. When CheR was overproduced, both the adaptation and methylation profiles of the mutant Tar receptor became comparable to those of wild-type Tar. Furthermore, overproduction of CheR also enhanced adaptive methylation of wild-type Trg, which lacks the NWETF sequence, in the absence of any other chemoreceptor. These results suggest that the pentapeptide sequence facilitates effective adaptation and methylation by recruiting CheR. Sites of deamidation and methylation in Tsr, a bacterial chemotaxis sensory transducer. The sensory transducer proteins in bacterial chemotaxis undergo two covalent modifications, deamidation and reversible methylation, in response to attractants and repellents. Oligonucleotide-directed mutagenesis was used to alter putative methylation and deamidation sites in one of the transducers to further define these sites and their role in chemotaxis. The mutations, in combination with peptide maps and Edman analysis, have clarified the sites of covalent modification in Tsr. Tsr contains six specific glutamates and glutamines that serve as methyl-accepting sites. An arginine-containing tryptic peptide (R1) has two sites, one at glutamate 493 and a newly located site at glutamate 502. A lysine-containing peptide (K1) has four methyl-accepting sites. Two of the lysine peptide sites are glutamates and can accept methyl groups without deamidation. The other two sites are glutamines and two methyl-accepting sites are created by two distinct deamidations. Both deamidations can occur on the same polypeptide chain. Single glutamate mutants have shown that one deamidation (at glutamine 311) proceeds rapidly, while the other deamidation (at glutamine 297) has a half-life of approximately 60 min under our experimental conditions. Structure of the Trg protein: Homologies with and differences from other sensory transducers of Escherichia coli. Transducer proteins are central to chemotaxis in Escherichia coli. Three transducer genes comprise a homologous gene family, while a fourth gene, trg, is more distantly related. We have determined the nucleotide sequence of trg. The deduced sequence of the Trg protein has features in common with other transducers as well as regions of significant divergence. 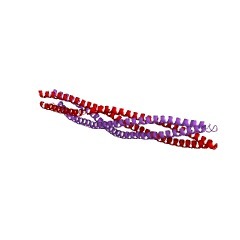 The protein sequence suggests the same transmembrane structure postulated for other transducers: an extra cytoplasmic NH2-terminal domain connected by a membrane-spanning region to an intracellular COOH-terminal domain. The COOH-terminal domain of Trg exhibits substantial sequence identity with the corresponding domains of the other transducers, particularly near the sites of covalent modification. 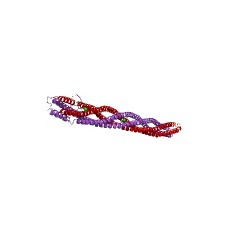 Trg appears to have the same five methyl-accepting sites identified in the Tsr protein. Two of those sites are glutamines that are deamidated to yield methyl-accepting glutamates, while the remainder are synthesized as glutamates. Conservation in number but not in position of modified glutamines in Trg compared to the other transducers is consistent with the notion that uncharged glutamines at a specific number of modification sites serve to balance the signaling state of newly synthesized transducers. The NH2-terminal domain of Trg exhibits no significant homology with other transducers, implying that trg may be a fusion of the common COOH-terminal transducer sequence with an unrelated NH2-terminal sequence. The location of specific mutations within trg provides support for the suggestion that ligand-binding sites are in the NH2-terminal domains. This information is based on mapping of SMART genomic protein database to KEGG orthologous groups. Percentage points are related to the number of proteins with MA domain which could be assigned to a KEGG orthologous group, and not all proteins containing MA domain. Please note that proteins can be included in multiple pathways, ie. the numbers above will not always add up to 100%.